Even with more outlets and devices competing for audiences' attention, viewers aren't moving away from live TV as much as they did a year ago, according to Nielsen's second-quarter 2016 Total Audience Report released today. The report found that live TV declines are starting to level off. 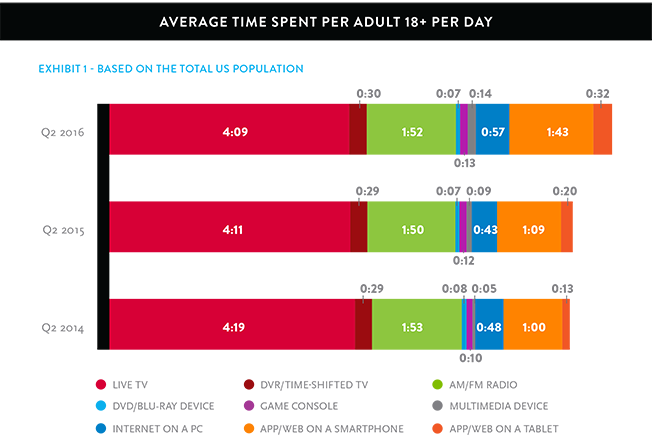 In the second quarter of this year, adults spent an average of four hours, nine minutes watching live TV, which is down two minutes from the same period a year ago. But there was an eight-minute decrease from Q2 2014 to Q2 2015. 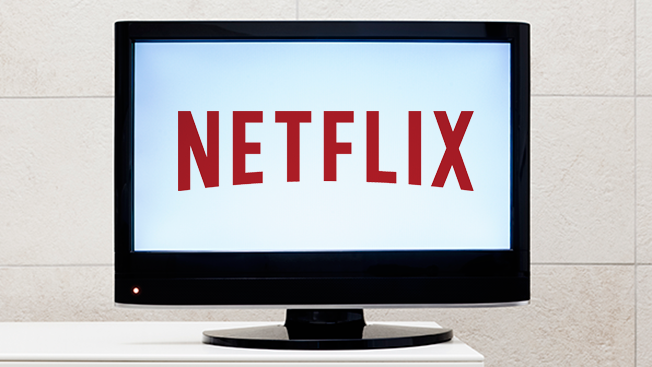 Nielsen's reports examine a new theme each quarter, such as the viewing habits of millennials. This time around, the report focused on the extent to which consumers are using all the options available to them. Among all adults, average DVR/time-shifted TV usage increased one minute for the quarter, to 30 minutes per day, after being flat the previous year. Elsewhere, Nielsen found that viewers now have an average of 205.9 channels available to them and watch just 9.6 percent of them (19.8) per month. That's down from 208 channels in the second quarter of 2015 due to factors like cord shaving. 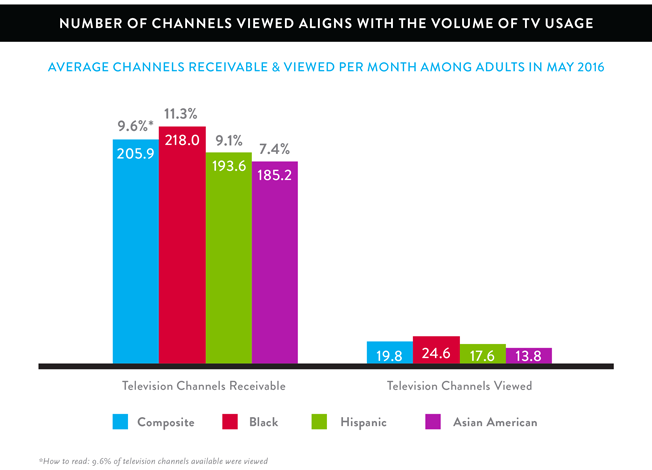 African Americans receive an average of 218 channels and watch 24.6 percent of those per month (11.3 percent), while Asian Americans have 185.2 channels on average and watch 13.8 (7.4 percent) per month. A year ago, the overall average was three channels more, but the average number of channels viewed per month was almost the same—19.9 compared to 19.8—which indicates that viewers are engaging in cord shaving and getting rid of networks they don't watch. 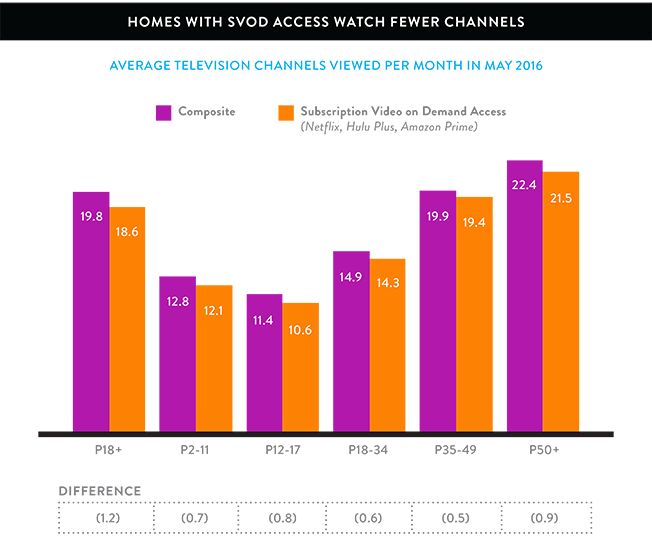 Homes with access to SVOD services like Netflix, Hulu and Amazon Prime watch an average of one channel less a month than the national average—18.6 compared with 19.8—but homes with SVOD access, which now represent half of all U.S. households, also are younger and have higher incomes, a demographic that tends to watch less television (and therefore has fewer channels). Radio continues to be the second-most-popular medium—adults spend one hour, 52 minutes listening to the radio each day. The full Total Audience Report is available here.